We believe that it is not only good, but necessary to talk about sexual pedagogy and sexual education in public spaces. Our information and methods are up-to-date, honest, and transparent. 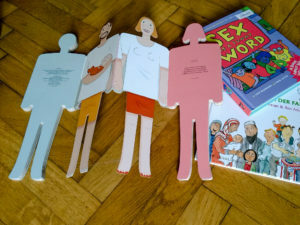 Sexual education and sexual pedagogy provide important interdisciplinary material that is not always covered by the public education system. Having sexual education as a subject in the education system is not something that educators take for granted in every European country. The World Health Organization regional office and Federal Center for Health Education in Germany (BZgA) provide a good example for Europe-wide standards. The team #unexcited utilizes these standards as well as the national and international legal frameworks and recommendations as guidelines in our work. The trained people who take on these topics – topics that are still taboo in our society – and do it with self-confidence and awareness for diversity deserve to be valued for the work they do. Because of this, we advocate for specific standards that will be implemented and anchored in the different countries. It is not only important to look at the content being conveyed, but also how it is being conveyed and for what reasons. Because of this, we have to ask: which basic foundations is this content building upon? The social and emotional challenges that come with discussions of relationships, feelings and sexuality need to be addressed holistically in all their diversity with scientifically substantiated methods and attentiveness to peoples’ individual needs. This is our task. Every person is unique and different. No person is wrong or abnormal. It is our responsibility to live accordingly. Previous PostThere is a reason for everything…or twelve.